On August 26th, 2015, Alan Christopher Pean went to St. Joseph's Medical Center in Houston, Texas, to seek mental help. He was admitted and then denied the help he needed. While hospitalized, Alan was attacked by two cops. He was tazed and shot by one of them. And he is being criminally charged with assaulting them. This article is a means to get to the real issues of this hazardous hospital. 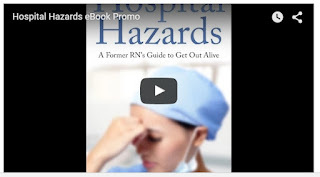 Bottom line about Hospital Hazards: A Former RN's Guide to Get Out Alive : Hospital hazards are caused by perceived authority. Authority that docs believe they have over patients, hospital workers, hospital administrators, and the public. And the obedience given to anyone who is believed to have authority. To get out of a hospital alive, we must rid ourselves of this obedience "virus" and challenge authority on all levels. Your life and the life of your loved one is at stake. eBook Excerpt - Is your doctor a sociopath? Below is an excerpt from Hospital Hazards: A Former RN's Guide to Get Out Alive that I'm about to get published. 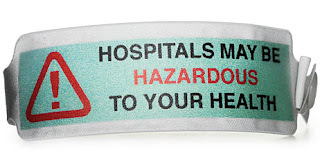 Please leave a comment and share with people you think would be interested to know more about how to protect themselves from hazardous hospitals. Chapter 7 – Is your doctor a sociopath? “Eighty-five percent of doctors, nearly six out of seven, refuse to use [computerized physician order entry systems] even when they know it saves lives, avoids unnecessary illnesses, and saves money. There is no other place in American life where personal prejudice is allowed to risk the loss of life or the imposition of unnecessary illness.” Newt Gingrich, former Speaker of the U.S. House of Representatives, Author, Saving Lives and Saving Money. In this chapter I will argue that a major contributing factor – perhaps the top factor – for why there are so many hospital hazards is directly related to the physicians’ sociopathic power over patients, nurses, and hospital administrators. In Chapter 1, I opined that most nurses enter the profession to help people rather than for a paycheck. Based on my interactions with hundreds of doctors through the course of my nine-year career, I will go out on a limb and state that the exact opposite is more true for doctors than not. When one considers that medical doctors are practically guaranteed a six-figure income and for many, more importantly, prestige and power – it is understandable that people with sociopathic tendencies will be attracted to careers in medicine. History is a great educator. Consider the following figures that lead countries into ruin – Stalin, Mae Tse Tung, Lenin, Hitler. These men were intensely flawed psychologically. What do these historical figures have in common with physicians? People looked up to them as god-like. People worshiped them, hung on their every word, believed they had special powers, and were willing to kill in the name of obedience to their orders. Those leaders got their power through the minds of their subjects. Notice the similarities between those past historical icons and today’s physicians. Our society considers physicians to be at the top of the healthcare food chain. People who are not part of the medical “club,” tend to look up to physicians as having special powers. We’ve been told that doctors get tons of training and that they save lives. They give orders to patients and nurses. Patients obey their orders because they believe the obedience will heal them. Nurses obey orders for three reasons: laws require it; fear of losing their jobs; and the most important reason nurses obey doctors is because of the “authority” that nurses mistakenly believe doctors have over them. Doctors get their power through the minds of we the subjects. In the rare case when a doctor enters the profession altruistically to heal, how long before that doc gets full of himself? People will hang on every one of his words. In other words, the god complex kicks into the minds of physicians and it’s pretty difficult – not impossible – but very, very difficult to be humble amidst all the lavish glory that surrounds them. Now let’s use another group of individuals who have a high rate of sociopaths – law enforcers. With guns, badges, and the law on their side, how many officers abuse their powers? And what recourse would a victim of police abuse have? Should a harmed individual go to a law enforcement supervisor or to the FBI? What are the odds that another law enforcer will hold the offending police accountable? Should the victim appeal to the city council or a mayor? Two reasons why the answer is a resounding no! First, elected officials depend on the protection of law enforcers. Second, powerful police unions helped get those officials elected. Therefore, elected officials will likely not want to bite the hand that feeds and protects it. Now let’s compare. If you are harmed by a physician, who are you going to turn to for justice? Most physicians work independently so it’s not likely you can appeal to a supervisor. You can complain to the State to try to get them disciplined or disbarred. But who do you think has had the most influence in writing laws that pertain to physicians? It would be the American Medical Association (AMA) and its state’s counterparts. They are like big doctor unions. They are all over the lawmakers to keep a close eye on their interests. What about turning to elected officials? How do you think those elected officials got elected if they didn’t rely heavily on the support of powerful physicians’ lobbies? What about going to the hospital administrators to complain about a doctor? That would be like a victim of police brutality complaining to the mayor. 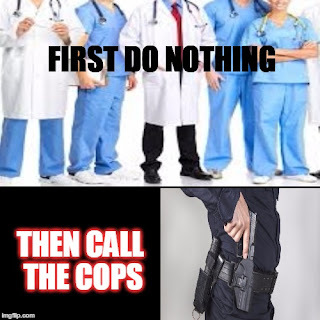 Like elected officials depend on law enforcers to keep them in power, hospital administrators depend on physicians for their economic livelihood. There is a cartel culture among many physicians. They protect their own often at the expense of patients. I have read numerous sources where a doctor breaks ranks with his own to expose the corruption he sees among his peers. Yet, I have yet to see a case where a doctor put his career on the line to fix the problem. To revisit my law enforcement analogy: Recently with the help of the Internet, there have been tons of reports about police brutality. The typical public response is to defend law enforcers and blame “a few bad apples.” The reality is that EVERY SINGLE LAW ENFORCER knows about colleagues that are terrorizing people that they are supposed to be serving. Yet, the vast majority of all police officers look the other way. Their motive to keep silent is usually to keep their jobs, or to avoid peer ostracism. Therefore, every police officer who turns his back to justice by avoiding confrontation with a “bad apple” is guilty by avoidance. The same happens within the medical professions. You have residents who are working under an established, high-ranking doctor. Those residents depend on the doctor to advance their career. And some of those residents expose atrocities they witness AFTER they are safe from professional ostracism. They keep quiet to avoid jeopardizing years of grueling training. I ask you – if it was your loved one that was killed by a deadly doctor while a resident watched, how much sympathy would YOU feel for that resident when you find out he chose the safety of his profession over the life of your loved one? Every hospital is hazardous - no exceptions! We were born in hospitals and it is very possible we will die in one. The U.S. system of healthcare is full of laws forcing us to use the services of those who have been granted healthcare power over us. They are the healthcare ruling class, and by law we are beholding to them. These healthcare rulers wield their power over us each time they give us an “order.” And if the “order” was immoral, unethical, or wrong, as healthcare consumers in the U.S., we are probably screwed. Why? Because laws are written by elected officials who owe their allegiance to healthcare lobbies. So, do you think laws favor THEM….or us? Hospitals should be temporary homes for people to heal. But instead, we are often made to feel like prisoners inside cold walls full of strangers who exercise their “authority” over us. We’ve been taught to believe in the virtues of those who selected professions dedicated to help and heal. But as you will see in this book, too often, the complete opposite is true. It is nearly impossible to hold an evil healthcare worker accountable for their actions. One reason is that they often commit their shenanigans in secret. This book is a means to expose some of those secrets in order to give you the power to prevent a hazardous hospital from harming you or your loved one. Healthcare in the U.S. is pretty much a complete disaster. 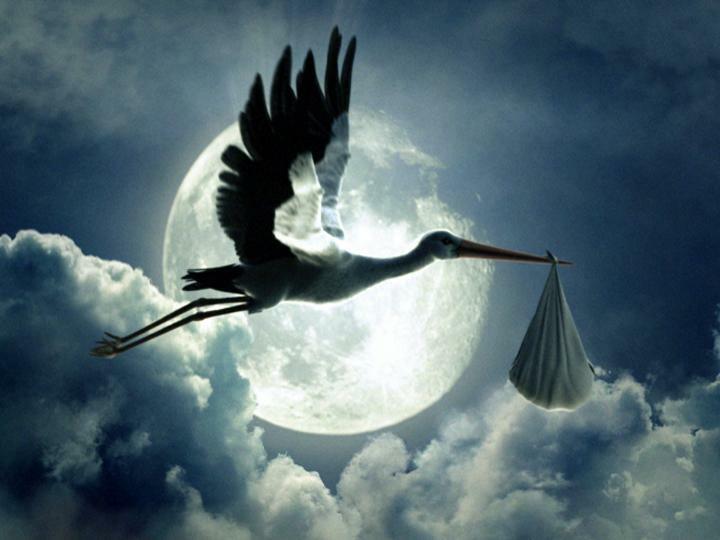 Countless articles, books, and media reports have illuminated the problems of infant mortality rates, medication errors, hospital acquired infections, and more. Many have attempted to explain the crisis. Physicians blame lawyers. Victims blame physicians. Socialists blame capitalists. Capitalists blame bureaucrats. Each group makes compelling arguments to support their side. Almost always, “their side” is either agenda-driven or naïve. But, I discovered one root-source that is attributed to just about every problem in healthcare. The source is entrenched very deeply in peoples’ minds. It’s sort of a superstition that has been inflicted upon us throughout the ages. It’s a truth that is so ridiculously obvious we resist to believe it, just like people before us resisted the truth that the world is round. You might ask, ‘if this truth is so obvious, then why doesn’t everyone know about it?’ Deep down we do. But we resist it because we are victims of propaganda. The truth about healthcare would discredit every pundit with an agenda. It would undermine the boloney we’ve been forced to believe. It would ruin the fortunes of those who protect a healthcare monopoly niche. It might even disempower government leaders who have aided and abetted the criminal elements in healthcare. If we could deprogram our minds from the constant bombardment of lies and propaganda that is fed to us daily, it would shatter the very existence of healthcare as we know it! I was inspired to write this book in an attempt to shift the power from the healthcare ruling elite back to the people. This book is written in two parts. The first is to describe the various professions in hospitals and their personalities. And it is to provide insights into the bureaucracy and the politics inside hospitals. The second part of the book deals with common hospital problems that cause discomfort and even death. It gives concrete ideas from my nine-years experience as a traveling nurse who has worked in some of the most hazardous hospitals in the nation. Laced throughout the book are “True Stories.” Most of these are drawn from my own recollections of experiences while working as a registered nurse. While the essence of each story is true, details were changed to protect the guilty from attacking me. Each story is to give you insights into various aspects of the makings of a hazardous hospital. It is my sincere desire that the information contained in this book will keep you and your loved ones from falling prey to a hazardous hospital. Did you know that you are 40 times more likely to be killed by a "deadly" doctor than by a drunk driver? According to a 2013 study, medical mistakes are now considered the third leading cause of death in the U.S. It’s a crisis that few people outside the healthcare arena can fathom. In this book, you will get a truthful inside perspective by a former registered nurse about the activities and reasons that contribute to this crisis. These acts take place behind the scenes in virtually every hospital and clinical setting. This book is NOT a fluff piece about the virtues of nursing, the promises of healing, or the altruism of healthcare professionals. This book is not laced with excuses about how healthcare providers and administrators are victims of a healthcare system that is indifferent to their needs. This book address YOUR needs. It's the the stone-cold truth about the systemic problems inside America’s hospitals that are killing our children, spouses, elders, siblings, and friends. From the nation’s top healthcare policymakers to the smallest hospital unit in a one-horse town, there is a pecking order. In that hierarchy, some give orders and others obey. The harsh reality is that far too often, those who give orders get full of themselves. Because of arrogance, greed, indifference, or incompetence, they will compromise peoples’ health and wellness without care. Perhaps even more disturbing is that sociopaths are attracted to positions of power. When a person of this flawed psychological mindset latches himself or herself onto a healthcare setting, the results can be utterly disastrous. This book identifies the mindset of individuals that are calling the shots for your healthcare. As history has proven, persons who take orders from those in authority tend to obey unconditionally. For many, the instinct to obey can be so strong that it overshadows the individual’s judgment. Will they be moral enough to disobey a harmful order? Will they report malfeasance? Will they object to questionable behavior? Will they have the spine to risk their careers to advocate for you? As we learned through history, world atrocities have been and are being committed in the name of obedience to authority. Imagine the chilling consequences of unconditional obedience in healthcare settings. The first part of this book teaches you to identify those obedient servants as well as the dangerous sociopaths. The second part teaches you how to protect yourself from those who blindly obey and those who ruthlessly command. The book will give you ideas, suggestions and information to communicate effectively and powerfully to get the best healthcare possible. In short, this book is about one former nurse who has nothing to lose and everything to gain by teaching the public how to get out of a hazardous hospital alive!